Each insect would drown in Mono Lake, a saline soda lake in California. Each insect, except for the alkali fly, which has unique adaptations to survive the extreme environment, as Floris van Breugel and Micael Dickinson show. Only bacteria, algae and brine shrimp tolerate the saline water of Mono Lake in California- and the alkali fly Ephydra hians, which flourishes here. It is an amazing critter. The larvae develop in the water, feeding on the algae. Adult flies, which occur in great numbers along the shores, regularly crawl into the water to feed on algae or to lay their eggs. They are the only adult insects that are able to dive into the briny water and emerge alive, Floris van Breugel and Michael Dickinson report. Several insect species exist that survive submersion in the water of lakes or streams, thanks to a water-repellent layer of hydrocarbons (waxy substances) on their cuticle and tiny hairs that trap a layer of air. But they would be wetted and drown in Mono Lake. That is because the water of this lake contains a large amount of sodium carbonate, a salt known as baking soda, the presence of which renders the insects incapable of keeping the layer of air intact; such water is ‘wetter’ than pure water and penetrates into the layer of air. Sodium carbonate is one of the substances that make the water strongly alkaline. But the alkali fly easily dives into the alkaline water and when it emerges, it is completely dry. The researchers show that this is possible because the diving fly possesses a very dense mat of hairs and a layer of superhydrophobic hydrocarbons which, combined, prevent wetting. Upon entering the water, a stable air bubble forms around the fly, which enables it to spend 15 minutes underwater; the bubble protects it from the hostile water and offers a supply of oxygen. In the past 60,000 years, Mono Lake became more salt and more alkaline because it has no outlet, and as water is evaporating, the concentrations of mineral salts gradually rise. 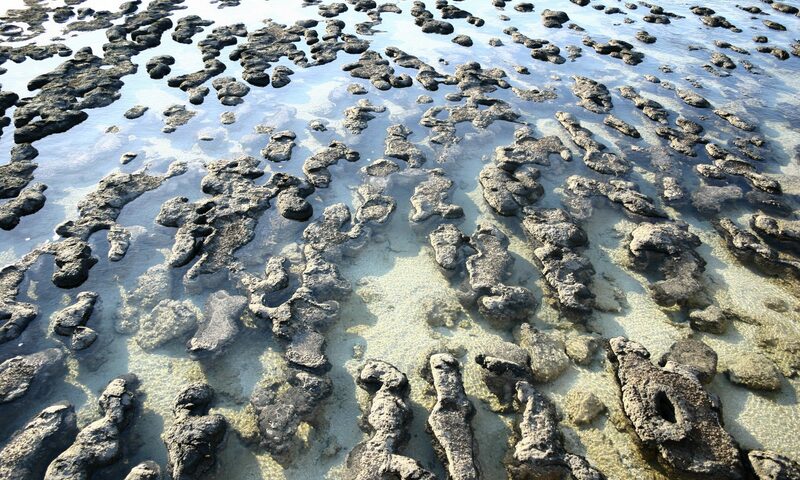 Limestone columns, named tufa, developed, along which the flies descend below water surface. 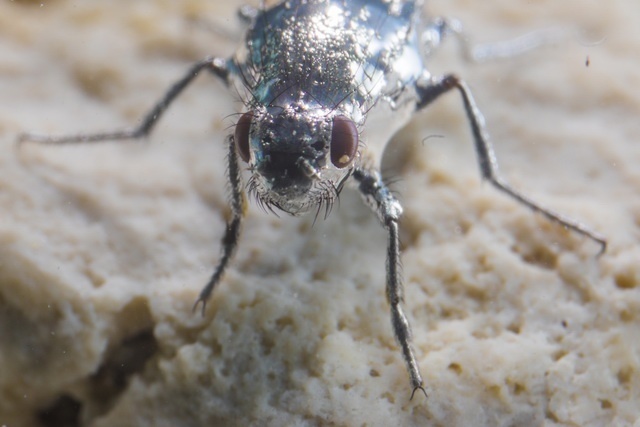 The alkali fly’s ancestors had to enter the lake to forage in a time when the lake was still fresh and algae were the only food available, the authors hypothesize. While the lake gradually became more alkaline, the fly adapted to the new conditions. Nowadays, it can safely graze underwater, as no fish predators occur. The flies are preyed upon by many birds that forage near the lake, like gulls. When oil, from decaying organic matter or sunscreen and other cosmetics, is floating on the water, even the alkali flies are wetted and drown, in spite of their unique adaptations.